Another college post?? You've heard that right. I love helping those of you moving into college this year figure out how to make the most out of your college (and dorm) experience. 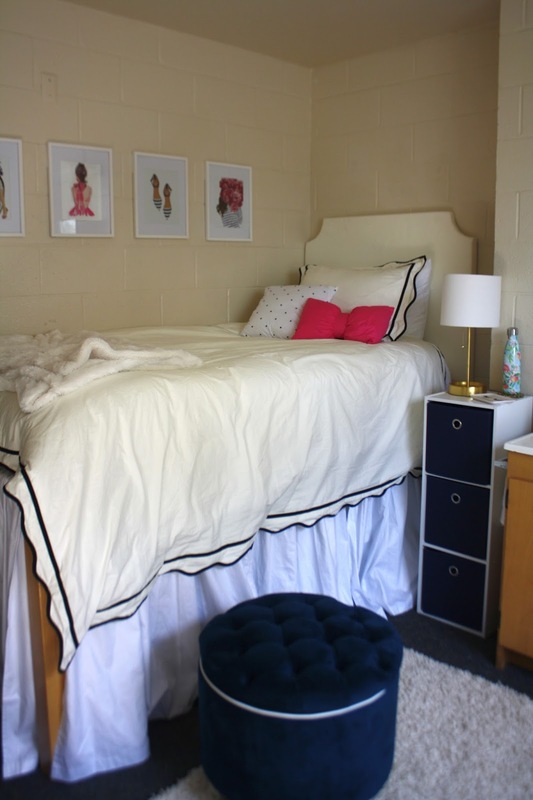 One of those topics is figuring out how to maximize your space in your teeny tiny dorm room. And if you're lucky to have a pretty big dorm (not gonna lie I did have a pretty big sized room freshman year!) 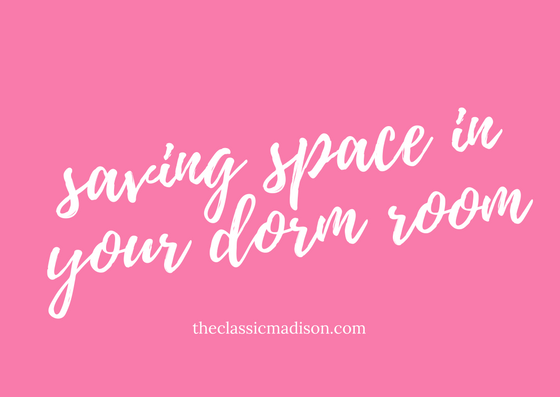 you still might want to hang around for this post as any method of saving space can really make your dorm room feel much more spacious, organized, and more! 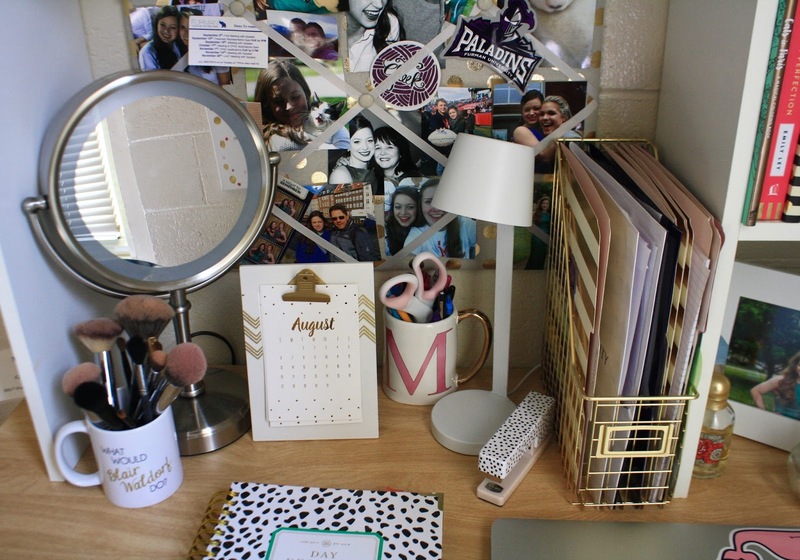 Stay tuned for my 5 tips for saving and maximizing your dorm room space! I cannot stress this enough. I put just about everything under my bed freshman year, and I'm planning on doing this for sophomore year. I found some super long storage containers from Bed Bath and Beyond designed for storage underneath your dorm bed! These stretched the width of my bed, so I was able to store way more than I could with rather storage containers. I also filled the underbed area with boxes and other containers. To keep the clutter away? Use a bedskirt! For those of you with either a lofted bed or bunk bed, you can still utilize this. Lofted bed? Give about half of the space underneath your bed for some sort of storage (a dresser, storage organizer, etc). For those with bunkbeds, you and your roommate should each get half of the underbed storage. While not much will fit down here anyways, you can still store a few items that might not have room other places! You know how big cities build upwards rather than outwards? Use this idealogy for your room. Use your wall for storage. Utilize command hooks to hang jewelry, coats, umbrellas, and purses. If you are planning on using your desk, consider buying a desk hutch. This was a lifesaver for me as I could store even more books, decorations, etc. in my desk space without it being cluttered. If you want to decorate your walls, consider adding some shelving that you can use to put books, picture frames, and more on. Any type of storage organizer that is hanging or can mount on the wall can really help you save some space! If you are planning on getting furniture pieces for your dorm or apartment, find pieces with storage built into them. Many ottomans come with inner compartments where you can store blankets, sweatshirts, etc. I used my ottoman to put all my bulky sweatshirts in, which saved space from my already overflowing dresser. If you want a bedside table, find one with multiple drawers or cubbyholes. I was able to store so much more in my bedside table because I got one from Target with 3 cubby holes perfect for storing multiple items. If you have a closet in your dorm, make use of every inch of it. I stuffed as many clothes as I could in that closet, packed with shoe organizers, a storage container, and more. You know all those fun organizers you can find at the Container Store? This is the time to use them! On your closet doors, utilize hooks to store even more clothes. If you are like me and want to bring a million things, try to limit what you hang up. Utilizing extra drawers to store items you would usually hang up (such as skirts, pants, etc.) can help give you more room to hang other clothes. This might sound obvious, but the biggest tip is to minimize what you bring to school with you. I know all my fellow fashion-loving ladies want to bring their entire wardrobe, but the truth is that bringing your entire wardrobe is not wise on your part. Bring clothes in seasons, and bring only what you absolutely cannot live without. I brought way too many blouses and shoes, and I usually ended up wearing leggings and an oversized t-shirt. Limit your clothing (especially shoes, jackets, and accessories). Also minimize collectibles and decorations from home. Your desk is too small to keep all of your favorite items from home. Just remember to minimize the amount your bringing. On the fence about bringing something? Probably best to leave it at home. 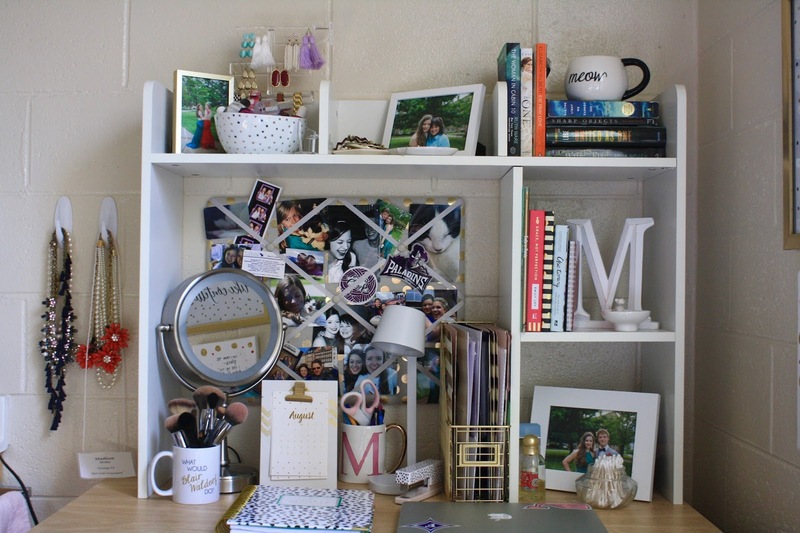 For those of you already in college, what have you done to maximize space in your dorm?? I found that using a desk hutch, underbed storage, and lots of command hooks really helped to keep my room organized. For those of you moving in soon, don't stress about what will fit and what storage to use. Sometimes it's better to wait until you move in to purchase those big storage containers so that you know exactly how much space you have and how much storage you need. If you all have any questions about maximizing your space even more, please reach out to me!